Whilst this would, of course, be expensive and timely to repair, it could lead to irreparable damage if it occurred in an original feature of a period property. This article is going to discuss the two types of rot; dry and wet. Whilst they both indicate the presence of a fungus and that the material has at least a 20% water content, wet rot may be more easily dealt with than dry. Wet rot is predominantly caused by either cellar fungus (also known as Coniophora puteana) and white pore fungus (also known as Poria vaillantii). 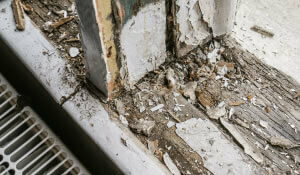 Wet rot spreads in damp, unventilated areas and if left untreated can cause structural damage. The first step in treating wet rot is to find the source of the moisture. This could be caused by anything from a leaking roof, gaps between windows to leaky plumbing so it’s vital that the source is located and quickly repaired. You will then need to ensure that the area is well ventilated and heated to dry out the damp. Once this has been done you should consult a professional to evaluate next steps It may be that the affected area will need to be removed to maintain the structural integrity of your property. Dry rot is caused by a fungus called Serpula larrymans which spreads in moist, unventilated environments. This type of rot is capable of penetrating your timber structures, including your timber frames and skirting boards, making them rot. If left untreated it could even make them unsafe. Dry rot is a serious problem which will cause the affected timber to either has to be removed or treated with a chemical fungicide treatment. This should be administered by a professional who would treat the timber itself and then the area around it. Should you find dry rot in your property you should contact a member of the Property Care Association or a surveyor through the Royal Institute of Chartered Surveyors to advise you. The most important thing to remember when dealing with rot is to identify the signs quickly and then take action.